I’ve been pondering Streaming Video On Demand (SVOD) services. Let’s say I want to watch Breaking Bad. I’ve heard great things about it, and I love high-quality long-form drama that good television provides. Blu-ray is the best way to watch this type of drama, for the ultimate in (domestically-available) quality picture and sound. But I don’t want to buy all the Blu-rays as I’ll probably only watch it once, then will have paid a bunch of money for a bunch of discs I have to find space for in the bookshelf. The emergence of SVOD services offers a solution. Pay a monthly fee of about ten dollars (even a year’s worth would be a lot less than buying all 5 seasons of Breaking Bad on DVD) to watch video streaming onto my television. Most of the services will work with computers, and also through Android/iOS apps via Chromecast onto a TV. As it happens, I just bought a Chromecast. At $50, it’s cheaper than the official WiFi adapter for my television, and infinitely more flexible. Neat device. Youtube looks great on it. I’ve also tried iView on it. It’s choppy — the ABC know about this, it’s only a beta version. Hopefully it’ll be fixed soon. So anyway, which SVOD service to go for? $9.99 per month. Works with ChromeCast. Includes HD. Uses Silverlight if watching on a PC browser — ugh! Includes Breaking Bad and the prequel Better Call Saul. Looks like they’re considering original programming too. They make it really hard to find the price, but it’s $9.99/month if you just want streaming, not the DVD rental option. Includes HD. Great content, but most HBO material seems to be premium, eg $2.99 per episode. Set to launch on March 24th, and expected to be about $10 a month — at least for Standard Definition — there apparently will be HD and Ultra-HD plans as well. Presumably will include Netflix exclusives such as House Of Cards — which I’ve started watching on Blu-ray, and am loving. It looks glorious in HD, by the way. Safe to assume it won’t include HBO content, given they are competitors in the USA. Presumably a lot of channel 7 content will be on here, including a lot of ITV stuff, since they have content deals. Also seems to have some Foxtel-produced television on it, such as the adaption of Cloudstreet. Speculation this will include Game Of Thrones, but that’s far from certain, as HBO apparently doesn’t allow it on SVOD services. If it does I’m probably sold. It does seem to include older HBO material such as Boardwalk Empire, the Newsroom (season 1 only, drat) and The Sopranos (all). I’m quite keen to see Tony Robinson’s (Australian) Time Walks, which was made for Foxtel — I can’t see it on there though. You’d think they’d put on as much Foxtel-exclusive content as they could, to differentiate themselves. ChromeCast and Presto had a free 2 month subscription offer (it expired at the end of February), so I’ve signed up to Presto and had a little look. The range isn’t huge — there’s probably more shows on iView, though fewer episodes — but is growing all the time. The playback quality seems okay. The iPad app is a bit beta-ish when using it with Chromecast though — normal playback onto the iPad shows, as you’d expect, a Pause or Stop button. When sending it to the Chromecast, all you can do is Stop Chromecasting. There’s no actual Pause — all you can do is stop, then if you want to start again, it’ll give you the option of resuming. Even skipping back doesn’t seem to work. Which is/are worth paying for? HD would be very nice to have, though bandwidth might be an issue with the services that offer it. Stan recommends 3.5 mbps for 720p, or 6.5 mbps for 1080p, and I’d expect the other services to be similar. (Hmm, I just ran a test: line speed 9.2 mbps, download speed 1.12 MB/s). 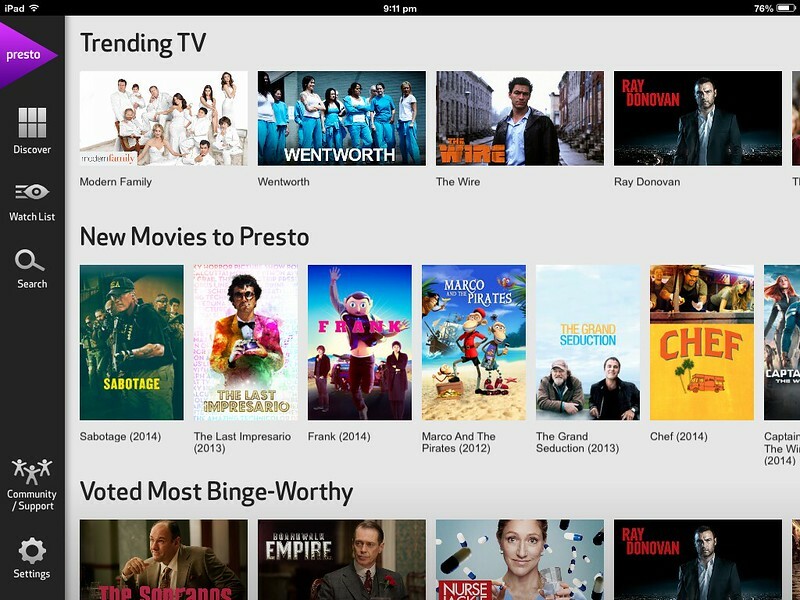 I’ll keep playing with Presto, and given Stan also has a free 30 day trial, try that out as well. But I’ll definitely try Netflix when it’s available too. ← Previous Previous post: Tram changes: Some make sense. Some, it seems, less so. It just shows what competition does – forces prices down. I just wish major sport also had competition on the TV with Foxtel being a monopoly provider and charging what they like. I remember hearing about Chromecast perhaps a year ago. The expected price here was $35, based on what it sold for in the US. Once again, we are paying more in Australia than the US without good reason. I would definitely need a free trial first, to see whether their HD transmissions look any good. I know they’ll technically be HD, being 1920×1080 pixels, but at a bit rate of 6.5 Mb/s, they are obviously transferring far less picture information than a Blu-Ray delivers with its bit rate of up to 54 Mb/s. If I could see compression artifacts in the streamed video on a 2.5 m screen, I wouldn’t pay for it. I’d rather stick with Blu-Ray until we have the internet capacity to handle proper HD transmission. And Netflix, unlike the others, won’t be charging you and won’t be paying the government GST. We love our Chromecast, have one on our telly and one on the bedroom too. And teacher it with a media server running Plex. Our kids love watching You Tube on the big TV. I get DVDs that ship from places in Melbourne where one of the discs has come off the spindle and has ring scratches all around it. Is really annoying since I have to return it and they hold it up to the light like I am trying to rip them off. Stuff I order from overseas comes packed well enough they don’t stuff up.